Philly Beer Week kicks off its fourth annual celebration of suds 7:30 p.m. June 3 with the Opening Tap celebration at the Independence Visitor Center, Sixth and Market streets. Makes sense: Our Founding Fathers were, after all, brewers. The event begins with the ceremonial first tap using the Philly Beer Week keg mallet that has come to be known as the Hammer of Glory. Brotherly Suds 2 will be the featured beer, brewed at Stoudt’s with the help of brewmasters from Yards, Victory, Troegs and Nodding Head, according to a news release. Stoudt’s brewer Brett Kintzer will ferment the lager with the same strain of yeast used in 1860 by Schmidt’s brewery that was formerly located in Northern Liberties, according to festival organizers. Tickets for Opening Tap cost $41, $15 for the designated driver; no tickets will be available at the door. Philly Beer Week runs June 3-12 and features hundreds of dinners, tours, tastings, pub crawls and meet-the-brewer nights. 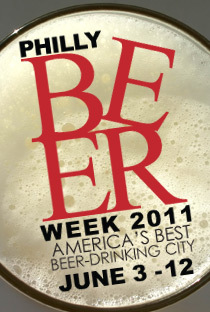 For information or to purchase tickets, visit phillybeerweek.org.